In the early 1970s, a group of young French men who were attending classes taught by Fr Marie-Dominique Philippe, O.P. at the University of Fribourg in Switzerland, felt called to give themselves to God and were seeking a way in which they could respond to His call. They turned to Fr Philippe, in whom they saw someone who offered a solid formation in philosophy as well as in theology and from a spiritual point of view. As the community of brothers was emerging and starting to take shape, some female students asked Fr M.-D. Philippe to start a branch for women. After some initial hesitation, he gave his consent in 1982 for several young women to live together in Rimont, under the guidance of Alix Parmentier (+ 2016). How are the different religious communities in the Family of Saint John linked? The brothers and sisters work together on some of their missions: youth camps, parish work and family weeks, among others. Together they run some of the bigger events such as youth festivals and festivals for families. Although they pray their offices separately they have the same breviary. Three times a year the Conseil de Famillle brings together the three prior generals and those responsible for studies in each of the congregations. The 80 sisters that currently make up the community of the Contemplative Sisters of Saint John have made the choice to cooperate with the Church authorities and to put in place the reforms asked of them during the crisis their community went through from 2009-2014. Since this difficult time, the sisters have been putting in place the required reforms (cf. history of the Family of Saint John). To support this important and necessary process, they have for several years now called upon the help of people from outside the community, in particular religious from other congregations. 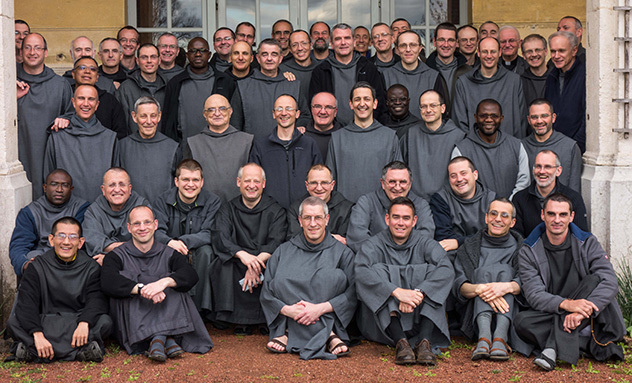 Oblates are laypeople who desire to live their baptismal vocation in the footsteps of Saint John and who feel called to live the same charism of the brothers and sisters in the world by committing to secular oblature. Anyone married or single, young or old, who wants to live the spirituality of the Family of Saint John is able to become an oblate. And so, despite living in the world, oblates live out their baptism and bear witness to it in the manner of St John. Before becoming an oblate, a candidate must undergo one to three years of preparation. This allows them to discern their aspirations and to deepen their understanding of the charism of the Family of Saint John. In order to achieve this, the candidate lives according to the rule of the oblates, participates in oblate meetings in their respective priory and follows at least two retreats preached by the brothers or sisters. Preparation for oblature is undertaken under the responsibility of the prior of the priory closest to where the candidate lives. At the end of the period of preparation, the decision belongs to the prior, following consultation with the members of the priory, as to whether the person can become an oblate. If you would like more information, please contact the priory closest to where you live. If you are interested in becoming an oblate, please contact the prior or prioress in the priory closest to where you live. You can then get more information and discern whether this path is for you.